It had me a bit stumped, as I couldn’t think of many things big enough for a tooth this size and I could think of even fewer with a tooth this shape. 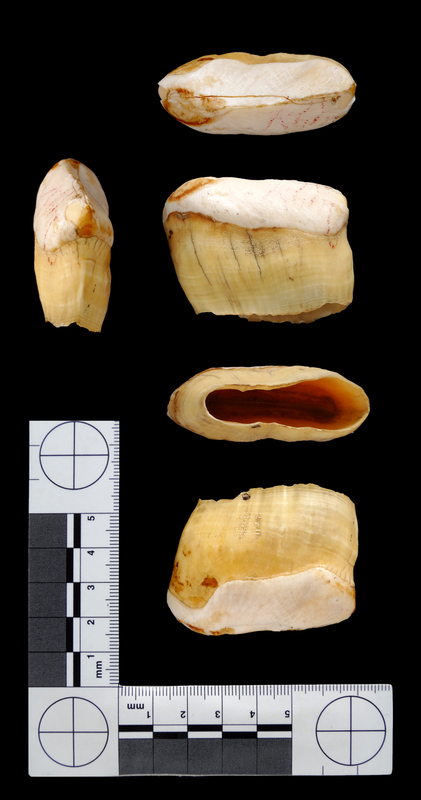 But the low and wide shape was all wrong for most of the whale teeth I can think of, except perhaps for the rather odd tusks found in the mandibles of some species of beaked whale. In fact, I was thinking that it might be the tusk of a juvenile or female Gray’s Beaked Whale, given the shape of the male’s tusks. However, Laura McCoy made a very useful observation (initially via ermineofthenorth) about the upper incisors (or premaxillary incisors) of the Indian Rhinoceros Rhinoceros unicornis Linnaeus, 1758. The upper incisors of the Indian Rhino are often missing in the adults, making them hard to find examples of, so unfortunately I’ve not been able to find a good image of them. However, Laura provided a link to an old publication with an illustration and there is an image of a skull at Skulls Unlimited that shows the incisors reasonably well. So a big thanks to Laura for helping to make an identification of a elusive and unusual tooth – that may even belong to the same individual as a previous mystery object.